Here it is. 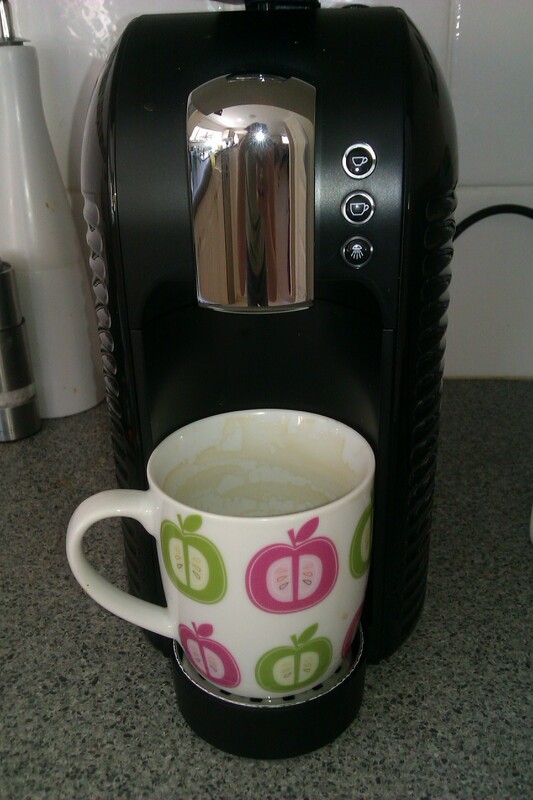 My new coffee machine, a birthday present from my twin brother. I’d not been a coffee drinker for over ten years but with two little kids chasing me around all day I decided that I wanted just one thing that I didn’t have to share. I’m so excited about using it for the first time I invite one of my neighbours over for a cuppa. From the outset the setup of the coffee machine was deceptively simple. Read the instructions. As a former technical writer it’s nice to know that someone reads instructions even if it’s only other technical writers. The instructions are so easy that they have pictures rather than words. My confidence grows. Make some room on my crowded kitchen benches. Not technically an instruction but a necessary safety measure. Shove things in kitchen cupboards and drawers. Plug it in and switch it on. Check. Clean and fill the water tank. Done. Flush out the system several times. My 3 year old does this for me. Too easy. Close the lever and press the large coffee cup button. At this point something goes wrong. It makes all the whirring and heating noises but only hot water comes out. I realise that the pod has gone down the chute into the disposal unit. No dramas. It’s a rookie’s mistake. So I retrieve pod and repeat step 8. It happens again. Like a good little technical writer I know to “go back to the manual.” I’ve completed steps 7 and 8 correctly. Hmm. It’s time to introduce step 8a. which only comes into play when step 8. is clearly WRONG. Idiots. Can’t be me that’s wrong. No. 8a. Very-quickly-press-large-coffee-cup-button-and-drop-pod-while-swiflty-pulling-lever. Triumph! I could be a barista! In reality I have to repeat step 8a several times before there is enough coffee for my neighbour and I. Previous An ode to wellies Next Let’s celebrate girls!